I am delighted to say that one of the major pieces from my Stuff and Nonsense exhibition will soon be going to a new home in London although I will be very sorry to see it go. I have a soft spot for this piece as it combines some of my favourite people with one of my favourite places. 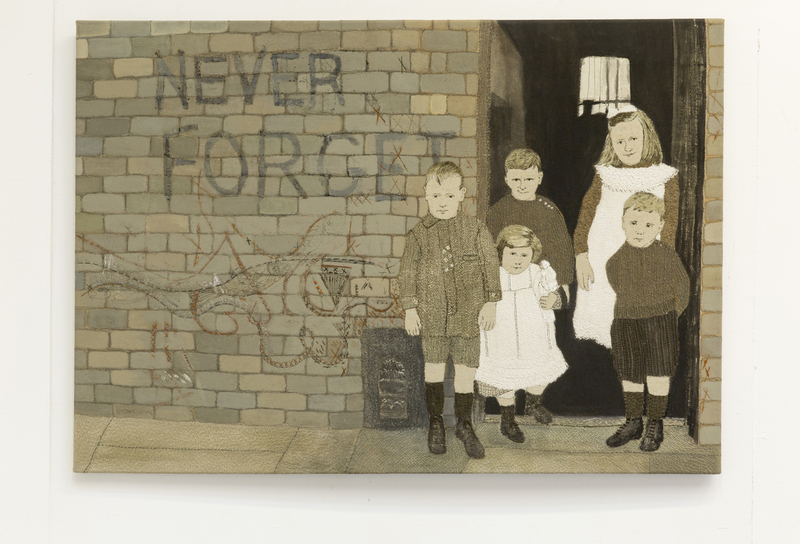 It was first exhibited in the 62@50 exhibition at the Holden Gallery at Manchester School of Art in 2012. 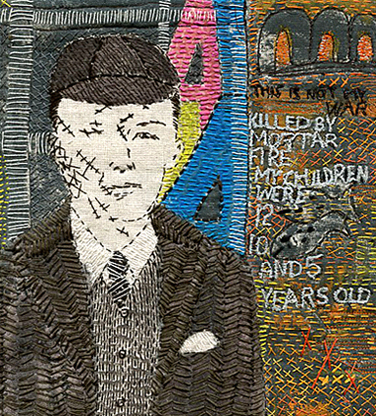 This entry was posted in 62 group of textile artists, Embroidery, Textile Art and tagged 62group, east end, exhibitions, Grimsby St E2, london, Machine stitch, sue stone, textile artist, textiles on July 15, 2012 by womanwithafish. My visit to the Victoria Miro Gallery did not get off to the best of starts. 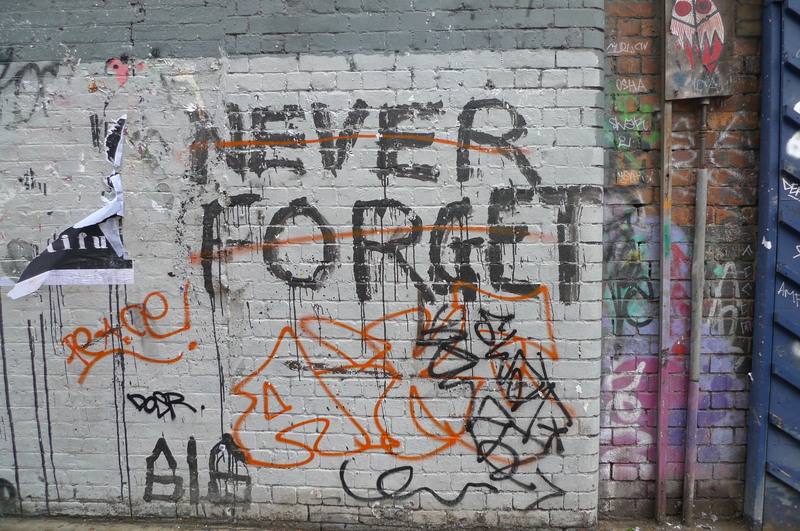 I began by taking a wrong turn down City Road out of Old St tube. Having walked to its end at no 1 the realization suddenly dawned that I was going to have to retrace my steps back to the station and start again. This time going in the opposite direction! 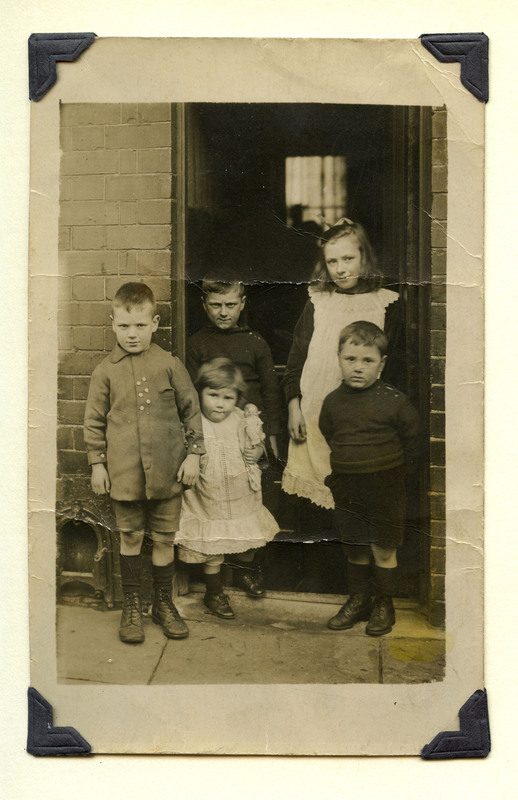 I eventually arrived at my destination a little footsore but with great anticipation. I was not disappointed. The gallery is set in a Victorian building with my destination, a large white cube extension on the roof. The daunting number of steps which have to be climbed to get to the roof extension should not put you off. It’s well worth the climb. On reaching the top there is a beautifully landscaped terrace to cross before arriving at the gallery extension itself which gives you a fantastic view over London’s East End. The Vanity of Small Differences tapestries by Grayson Perry, which I had made the journey from Grimsby to see, are both powerful and perceptive and the scale is impressive. His use of colour is sublime. I loved the humour within pieces which explore taste and class. There are six of them in total displayed in this modestly sized gallery along with five of Grayson Perry’s ceramic pots as a bonus. As I perused the work I found myself wondering what it would actually cost to produce a 4 metre x 2 metre tapestry ! Based on Hogarth’s 18th-century narrative paintings Rakes Progress which tell the tale of Tom Rakewell, as he rises from working-class obscurity to greatness – and then falls again, the images are full of references to brands, to celebrity,and to religious paintings. Perry’s hero is Tim Rakewell , born to a working class family, he goes to University, and journeying up through the Middle classes he ends up as a multimillionaire who comes to a tragic end in a car crash.Looking at my watch I was amazed to find that an exhibition with only eleven pieces of work in it had kept my attention for over ninety minutes.Well worth a visit. 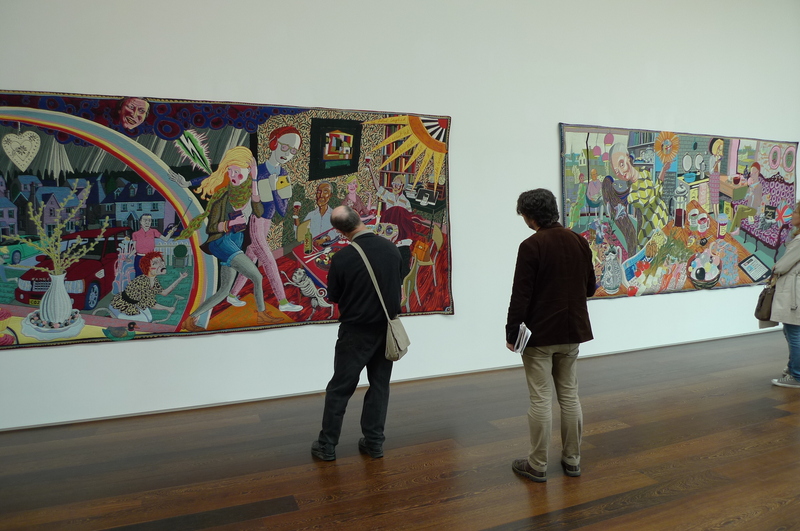 Grayson Perry’s new tapestries are at Victoria Miro Gallery, London N1 from 7 June to 11 August. The accompanying TV series All in the Best Possible Taste can be seen on 4oD. 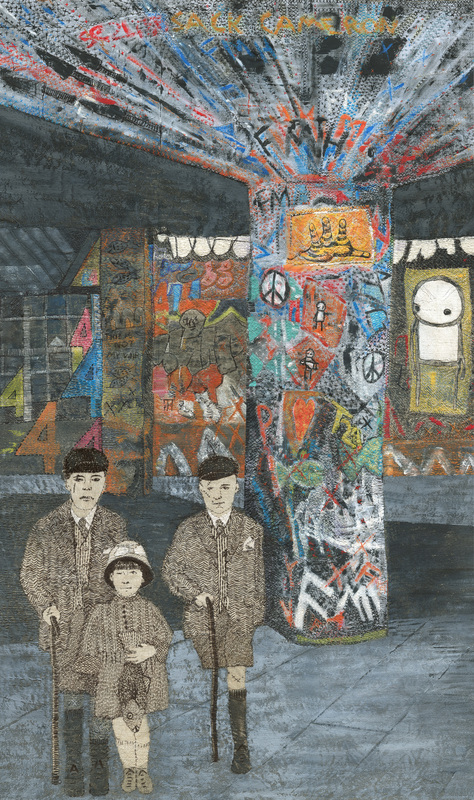 This entry was posted in Art Galleries, Textile Art and tagged class, east end, Grayson Perry, review, tapestries, taste, Victoria Miro on June 27, 2012 by womanwithafish. I decided I was getting a bit set in my way of working and becoming a bit formulaic! Time to experiment and take a slightly different direction. More of a development than a radical change but nevertheless a new challenge. I have worked in mixed media before with varying degrees of success using photography and stitch and also weaving and stitch but this time I am combining paint with stitch. Stitch is still very much the dominant discipline but in my new pieces, the paint , whilst bringing a new dimension is fully integrated with the stitch. 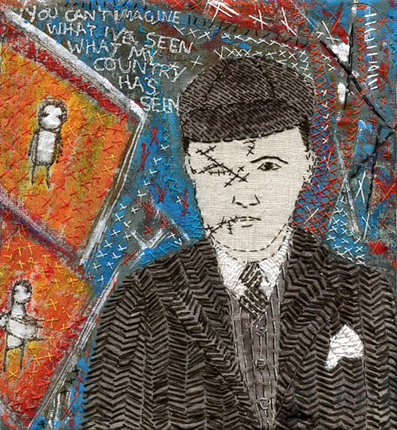 This entry was posted in 62 group of textile artists, Embroidery, Textile Art and tagged 62 group of textile artists, east end, graffiti, hand embroidery, london, mixed media, pai, paint, stitch, sue stone, textile artist, textiles on May 30, 2012 by womanwithafish.